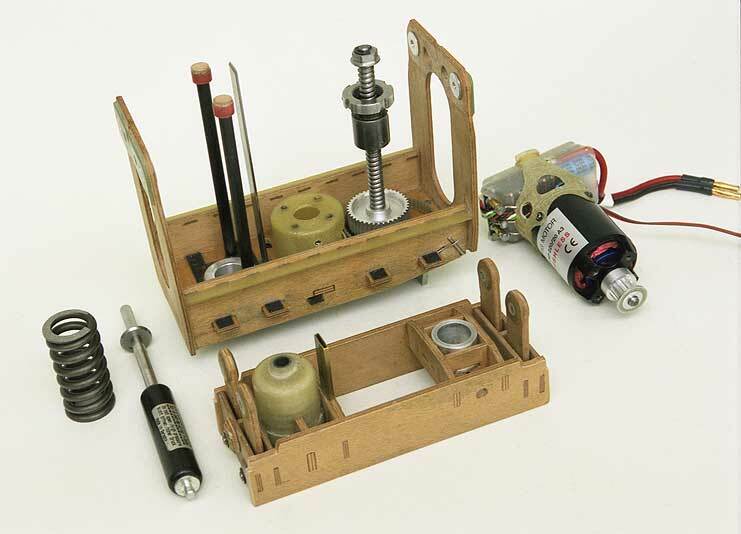 For transforming a rotating motion into a linear motion a ball screw is used for the EV8. Paul MacCready has used a corresponding technology for his pterodactyl replica QN in 1985 (For details about his drive principle of QN please look at the papers, in German). For the hereby chosen dimensions a revolution reduction of 38:1 is included - based on one flapping cycle. The efficiency for both conversion directions constitutes of about 0.9. These excellent properties were the crucial factor to renew the drive development. But therefore two motor reversals of rotation are necessary in every flapping cycle. 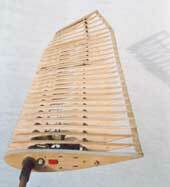 This process corresponds to the change of rotation direction of small servo-driven ornithopters. 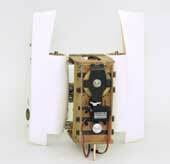 Instead of the ball screw drive a ball reverser actuator may also be used. Then, the electric motor must not change the rotating direction (please look at related link 1). If such a spindle drive to day will be designed by experts it could be very compact and effective (please look at related link 2). Instead of the inflatable pneumatic spring with a rolling-diaphragm usually used in the EV-models (Please look at driving mechanism of the EV4), an industrial gas spring is used in the EV8. Unfortunately, its spring force is not repeatedly adjustable to zero (e.g. for the test run of the drive), but its spring rate is very small. 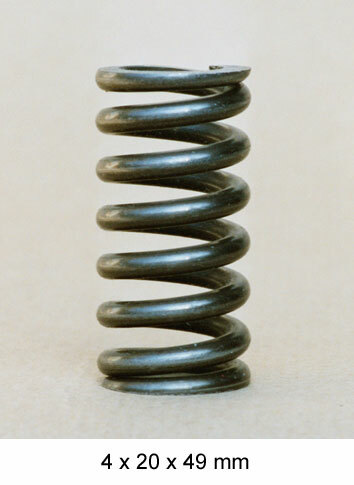 With great spring forces in connection with a small spring rate gas springs offer advantages to corresponding steel springs. They have a smaller design and lower weight - but also higher losses. 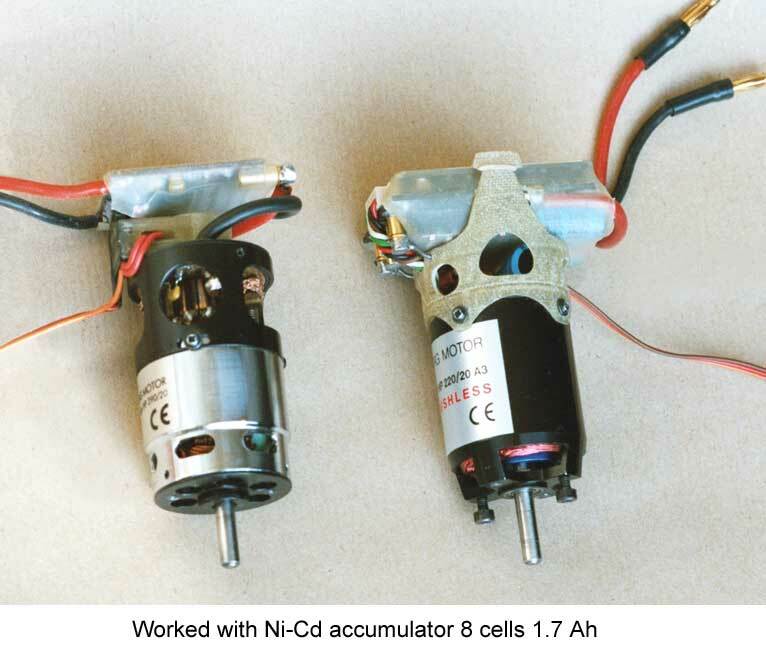 With an effective energy recirculation via the ball screw drive and the speed control in the battery packs this so-called compensating spring can later be omitted. 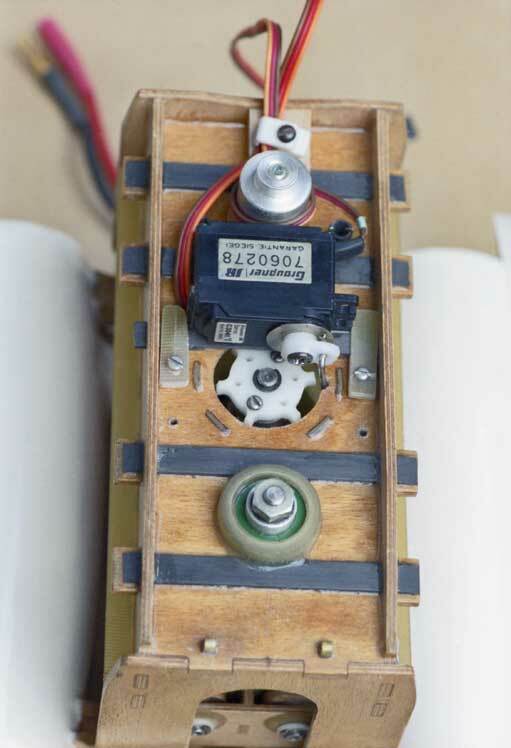 At the beginning of the EV8 development a brush less motor was planed - at that time still with sensors - because of its relatively small mass moment of inertia. But after model completion there was no speed control with a sufficient short delay at reversal of rotation. Therefore a motor with carbon brushes had to be used instead. Today, there are also speed controls for brush less motors with a sufficiently fast reversal of rotation. The calculated required average wing input power of the EV8 was about 67 Watt. Taking all losses into account, the average motor input power was 127 watts (maximum value of a flapping period 199 Watt). 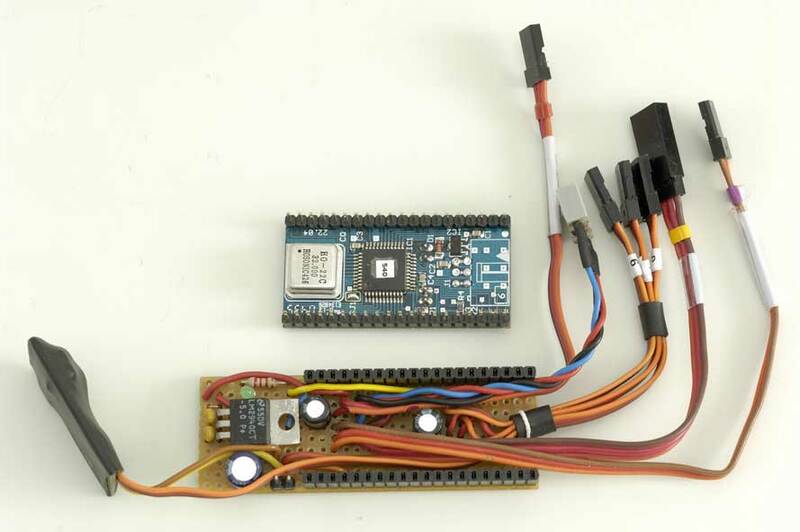 In the course of testing the shown test setup the decision was made to accomplish it with a programmable logical module (also called PLD or microcontroller). Lacking sufficient programming knowledge I could only substitute about half of this hardware with it at first. But in the meantime microcontrollers have become so capable, that even with a simple BASIC programming language all can be stored in only one chip. 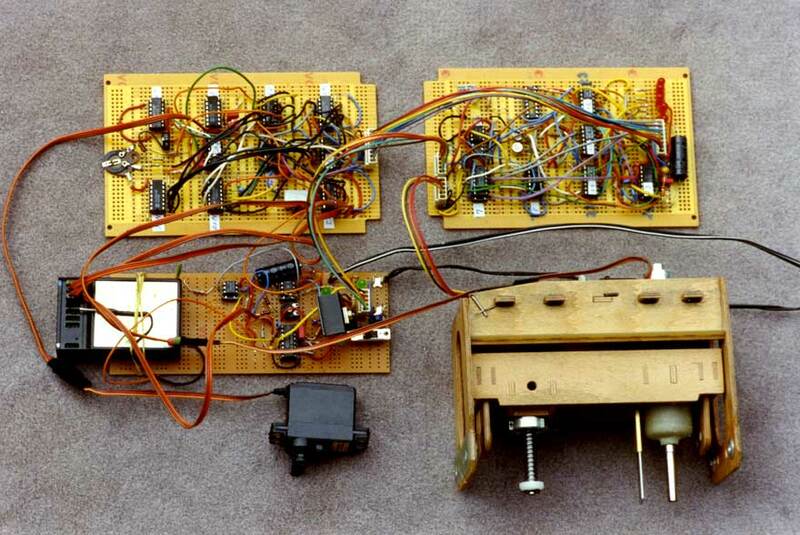 With the pictured storage-programmable control device one can control drives for flapping frequencies up to 8 Hz. 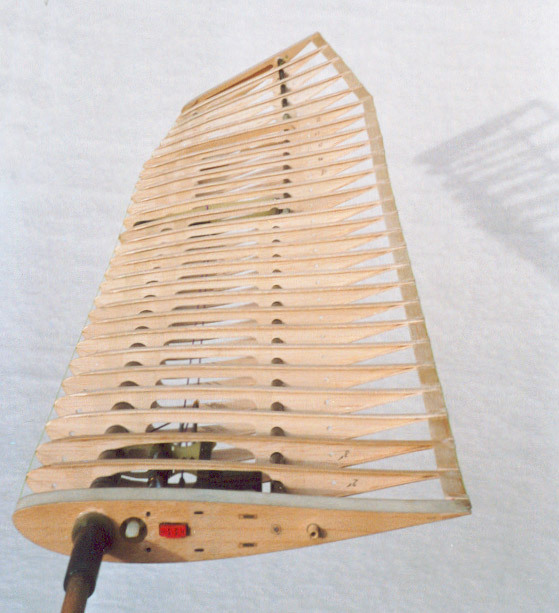 In front, one can see the swing (frame of plywood) usually used in EV-models for load balancing to the wing adapter rollers. Behind this, there's the chassis of the mechanism first conceived for the EV8. 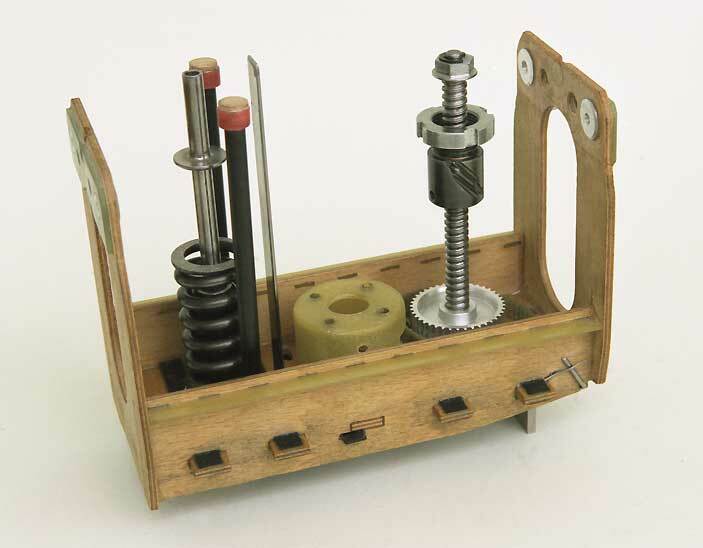 with screw drive, springs and guide bar, but without the motor. It made the installation of the drive as a whole in the fuselage and its removal possible. 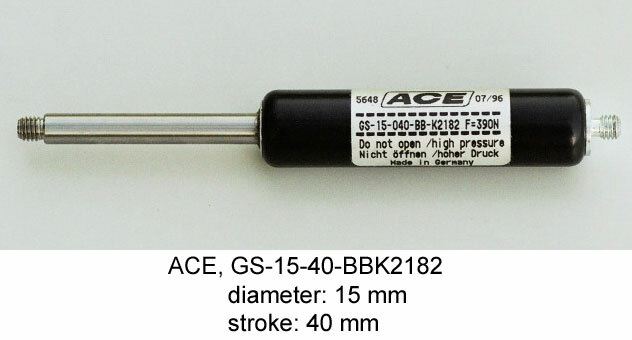 The gas spring is also used as guidance for the steel spring. 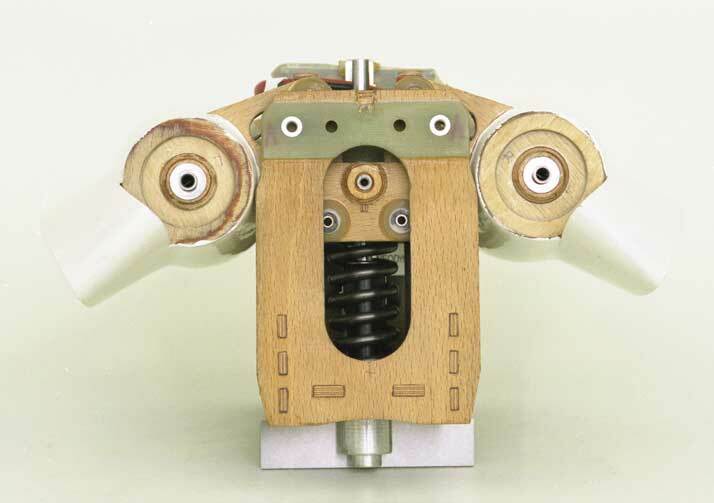 The mechanism of the brake as shown above has already been changed during the tests of gliding flight. The braking forces have been too small for high starts. The braking forces have been too small for high starts. At the same time the connected digital rotation counter has been replaced by an analog position encoder (potentiometer). 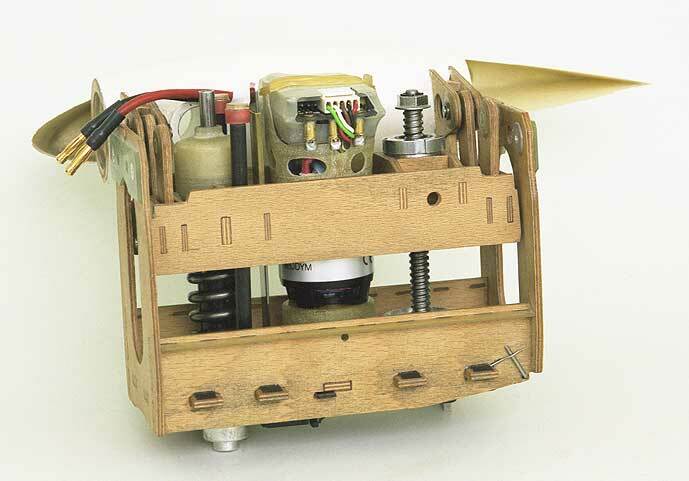 The drive unit can be mounted relatively simply in and out of the fuselage as a complete unit, weight 440 g [15 oz] (without wing adapter rollers). The whole electrical equipment is placed in the front part of the fuselage. The whole design of the EV8 was made with CAD. Thereby, a very compact construction could be obtained with passable effort. When using a ball screw drive the direction of the motor rotation must change with every reversal of the wing flap direction. At first, it seems to be a little unfavourable. But if the reversal of rotation is largely affected by mechanical forces from the outside, losses of the motor are kept within limits. The advantage of this drive technology lies in a relatively high degree of efficiency in the center part of the stroke. Also at the previous EV-mechanism the drive motor was not very effective in the range of the final stroke position (no-load operation). The change-over of the motor happens when the wings reach their lower pre-final position during the downstroke. At first, due to the delay of time the speed controller works like a switch-off. The lift at the wing is directed towards the still running downstroke. Thereby, the moved masses become slower. The lift force and the wing twisting become decreased, too. If the downstroke comes to standstill in the lower final position, theoretically the wing twist equals the one in gliding flight. Also the lift force. Now it accelerates the wing upwards again. Approximately at the same time the electrical run-up of the motor in the new rotation direction is getting started. But it still works without loading to a large extent. Via the ball screw drive the acceleration of the motor is mainly affected by the wing forces. With increasing upstroke speed the lift forces continue to decrease. More and more the wing takes on the maximum upstroke twisting position. It is reached approximately in the lower pre-final position. There, the motor has reached the full rotation speed. With its electromechanical force it now takes over the drive for the next upstroke of the wing and the tensioning of the compensating spring. 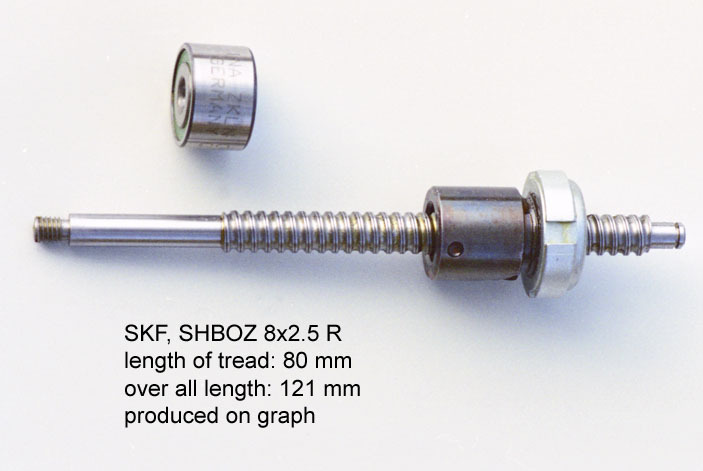 For the whole procedure the high efficiency of the ball screw drive is very important when converting a linear motion into a rotating motion. The reversal of motion work - also of the rotating drive components - is primarily affected by the wing lift force. 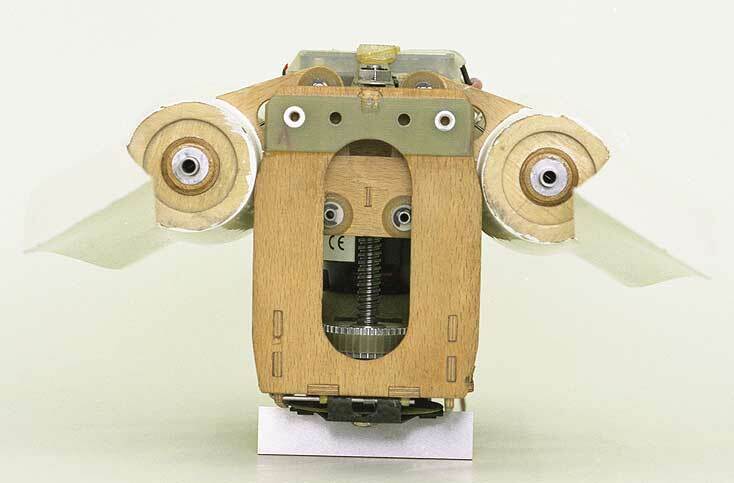 Among the rotating drive components are the ball screw drive, timing belt pulleys and the motor (rotor). Because of its high rotation speed the angular momentum of the motor is considerable. Also, you can support the reversal motion of the wing in the lower final position by an end position spring as at the (rack and pinion drive system). This would be without importance for generating thrust, but unfavourable for the lift. Instead of the wing lift a so-called end position spring made of steel takes over the positive and negative acceleration of the masses in this range. Else, the motion sequence works analogically to aforesaid. In the area of the upper final wing position there even during the upstroke decreasing lift always works against the reversal of motion. Hence, the end position spring also must overcome this force. 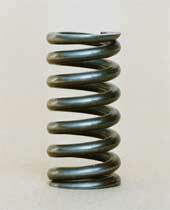 Accordingly strong is its dimension (spring force max. 976 N). If the energy recirculation of the wing mass momentum via the ball screw drive and the speed control in the accumulator are effective, the end position spring can later be designed frailer. The flow of energy of the oscillating flapping wing mass is specified in the handbook, chapter 5.3. 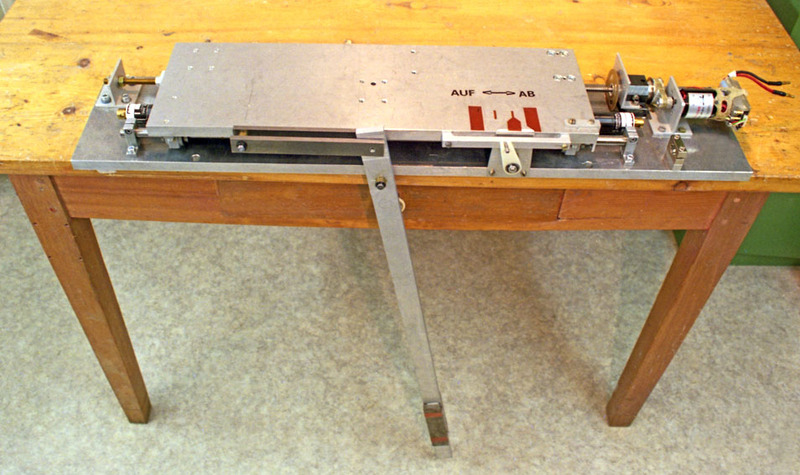 To test the drive functions of interacting electronics and mechanism there was built a test rig. The pendulum hanging downwards has the same mass moment of inertia as the two flapping wing halves. The aerodynamically forces of up- and downstroke are roughly reproduced by adjustable dashpots. But some questions remain open till the practical testing of power flight. Lightweight, resilient high-performance	power unit with high efficiency for the elastic motion of a robot arm.